PARIS – Boeing wants U.S. and international regulators to relax constraints on low-orbiting satellite broadband constellations using C- and V-band and has specifically asked for a license to launch and operate a network of 1,396-2,956 V-band satellites. The company outlines its network’s features for orbital debris mitigation, both in terms of how the satellites would be designed to withstand debris impact and how they would be removed from orbit on retirement. Boeing does not estimate how big or costly the satellites would be, but says they will have on-board backup for all vulnerable or critical satellite systems and bumper shields and debris blankets for debris protection. The company says the satellites would have only one propellant tank and that 90 percent of the propellant would be reserved for lowering the satellites’ orbit to an altitude of less than 500 kilometers. From there, their orbit would naturally degrade and they would be pulled into the atmosphere well before the 25-year limit encouraged by international recommendations. C-band spectrum reserved for satellite systems has been under regular attack by terrestrial-wireless interests for years. At a June 13-14 meeting at the International Telecommunication Union (ITU), which regulates wireless spectrum and satellite orbital slots, satellite industry officials said those attacks are continuing despite last year’s World Radiocommunications Conference (WRC-15) of global regulators, which reaffirmed satellites’ regulatory primacy in most of the C-band spectrum. It was at this meeting that Audrey L. Allison, Boeing’s senior director for frequency management systems, asked for a broad review of C- and V-band spectrum rules at the WRC conference scheduled for 2019. The reviews were put on regulators’ agenda at WRC-15. Allison’s principal argument is that current power limits on C- and V-band satellite networks were set more than a decade ago, when a proposed highly elliptical orbit constellation was in planning. The network was never built, but the regulations remained in force. 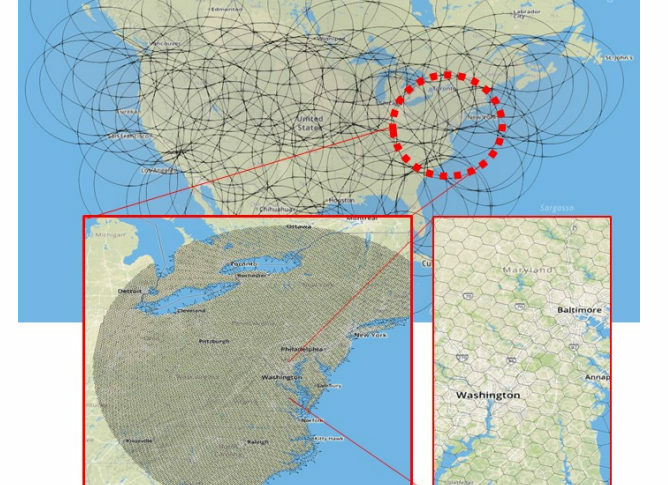 Boeing’s proposed V-band network, like its C-band proposal, is for constellations in circular orbit, which the company says poses less of a threat to satellites broadcasting the same frequencies from geostationary orbit over the equator than would a highly elliptical orbit. Allison said Boeing, as a builder of geostationary-orbit satellites, would not enter the broadband LEO constellation market, where multiple systems are in the proposal stage, if it had not assured itself that coexistence was feasible. Boeing’s V-band proposal would deliver broadband to individuals, businesses and government users. The company’s C-band idea is not on its own behalf, but rather a proposal to regulators. Boeing has not made regulatory filings for a C-band constellation of its own. Operators of Ku-band telecommunications satellites in geostationary orbit have expressed reserve about OneWeb. Tony Azarelli, OneWeb’s regulatory and policy vice president, told the ITU conference that the company would follow all ITU procedures to protect Ku-band emissions from geostationary satellites. The issue is particularly critical over the equator, where OneWeb has committed to switching off some of its satellites’ beams to reduce signal strength, called equivalent power flux density limits, to avoid interfering with geostationary satellite signals. Allison did not address what measures Boeing’s C-band network would take to avoid the same issue. V-band remains a largely unexplored as a commercial broadcast frequency. Terrestrial 5G cellular networks propose using it, and Boeing’s FCC filing says it can coexist with them as well as with any future V-band satellite systems. As is true of most satellite broadband systems being designed, Boeing’s C- and V-band networks would feature intense reuse of the broadcast frequencies. For the V-band network, the company says each satellite’s beams would be subdivided into thousands of cells, each 8-11 kilometers in diameter and each carrying up to five 1-gigahertz channels. Boeing is asking regulators – the FCC has notified the ITU of the V-band network filing – not to divide the 5 GHz of V-band spectrum, but rather to allow any future licensees to share it. The company is asking the FCC to modify eight of its rules to permit the system’s development. For example, the FCC’s equivalent power flux density limits are stricter than the ITU’s; Boeing asks that the U.S. regulator raise its limits. Boeing is also asking the FCC to accept a two-part deployment plan without affixing licensing and bond-deposit requirements on each. The first deployment would be of 1,396 satellites – 35 planes orbiting at 45 degrees’ inclination relative to the equator, and six planes at 55 degrees. Once the business plan justifies it, the remaining 1,560 satellites would be launched, adding 12 more planes at 55 degrees inclination at the same 1,200-kilometer orbit, and 21 planes inclined at 88 degrees and orbiting at 1,000 kilometers in altitude. In her ITU presentation, Allison made clear that systems like this cannot be built without regulatory modifications. “Radio regulations now are based on previous-generation NGSO [non-geostationary-orbit] technologies and effectively preclude operating NGSO systems from fulfilling the vision of a true NGSO global broadband system,” Allison said. Boeing is developing concepts for a global broadband system that would provide a wide range of advanced telecommunications services for commercial and governmental users. With that in mind, Boeing has applied to the U.S. Federal Communications Commission (FCC) for a license to utilize spectrum it would need to support such a service. As stated in the FCC application, the proposed system would operate in the same V-band spectrum as fifth-generation (5G) systems. Boeing believes technological advances make possible the effective sharing of spectrum for the delivery of global communications services, including satellite-delivered broadband and terrestrial 5G applications. Although a great deal of spectrum is already available for current generation mobile wireless, Boeing recognizes the need for spectrum is constantly growing as 5G services approach the market. At the same time, Boeing believes the FCC must ensure that any 5G designations provide protection for existing satellite services and future growth of the satellite industry. With the requested license, the company could contribute to the public interest by injecting new competition and expanded capabilities into the broadband satellite services industry. Boeing supports the FCC’s desire to extend America’s leadership in advanced communications services and to foster the widespread availability of broadband services, including to unserved and underserved regions and populations. As it enters its second century of innovation in the global aerospace and satellite telecommunications industries, Boeing believes the proposed system would offer the additional public benefit of extending U.S. technological leadership in the next generation of satellite products and manufacturing. Designing concepts for a broadband system is a natural evolution and extension of our more than 50 years of experience designing and manufacturing complex satellite systems, coupled with our ability to integrate advanced technologies in networked communications. While the FCC considers its license request, Boeing will continue to develop technical and business plans for the proposed system. For proprietary reasons, Boeing will refrain for now from providing additional details beyond what is contained in the license application.